Normally, I offer little-to-no commentary on the strips and pages on the day they’re released. Last Thursday, I broke that rule a bit by linking to past Bubbles of Light episodes. I though it would be helpful and most of you seemed to enjoy that. You see, a small part of the storytelling of the SuperFogeys is a game I’m playing with you, the reader. I like putting in little clues and hints about things that won’t pay off for quite a while. It can even take years. Today’s strip is a payoff very much like that. There’s been a lot of speculation about who the father of the O’Hara Brothers could be, but some of you knew as far back as Chapter 5 just by picking up on the clues. For those that didn’t, what I’d like to do now is take you through a little journey. Below are the links, in order, of the strips that led us to this moment. There’s not many and there’s a lot of dots that you wouldn’t think to connect, but it’s all pretty much there. See what you think. SF 35 – The Healer’s father is first mentioned. We get the idea they don’t exactly get along. SF 55- The Healer first mentions his father and talks about him coming to Valhalla. SF 74, SF 80, and SF 103 – 3 young men with black hair and successful and not-so-successful musical careers. My subtle (really, really subtle) hint that they were brothers. SF 141 – Dictator Tot leaves Valhalla. Bombs are mentioned once again. SF 148 – The Third Man betrays Dictator Tot and sends the Society of Heroes to her. SF 182 – Notice who’s standing together? Another clue about the brothers. SF 212 – The Brothers confirmed. And that pretty much brings us to this strip! It took a while, but the Third Man finally got Tangerine into Valhalla, just as he agreed. See? The Third Man’s not so bad! He’s a man of his word! What do you guys think? Am I giving away too much of the store, or is this fun/helpful? DAVID REDDICK IS AT IT AGAIN! On Tuesday I announced that David Reddick will be doing a 2-page SuperFogeys Origins story. It’s not something you guys are gonna see for a little while yet, but since getting the script for it (I’m writing, he’s drawing), he’s been drawing up a storm and having a ton of fun honing his take on the SF crew. 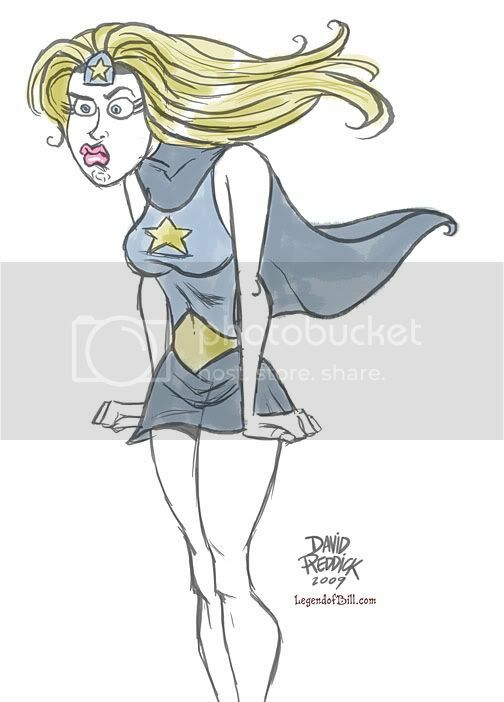 I love his take on Star Maiden. This is what she’ll more or less look like in the time period the story is set in. Someone asked me after seeing this if she’s supposed to a little crazy like she is now. No, she’s just ticked off. You’ll find out why. This is David’s second go at Spy Gal, incorporating a note from me about he having long hair when she was younger. Love this. I know that some of you have been having trouble seeing these images I’ve been posting. If you don’t see anything above, it probably means that you’re using Internet Explorer. We don’t know why that’s happening yet, but we’re trying to figure it out. Might I suggest using Firefox instead? Or, you could just head on over to David’s excellent Legend of Bill where he has been posting the sketches as well. On Tuesday, Mega Matt gives lessons in how to yell to Swifty back in 1955. Be back here on Thursday as we catch up with Swifty in the present and he receives an unexpected little visitor. Order your copy of SuperFogey Collection #4, ARTIST Edition here! Order your copy of SuperFogey Collection #4, REGULAR Edition here!